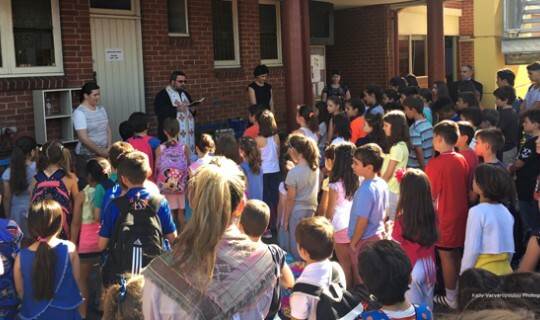 The new school year has successfully commenced at the Greek Language and Culture Schools of the Greek Community of Melbourne. Enrolments have further increased as more parents entrust their children’s Greek language learning to GCM schools. With a reviewed curriculum, experienced and professional staff, on-going professional development programs, the integration of technology and modern pedagogical approaches, it is expected that the teaching and learning of Greek will be a very successful and fruitful journey at the GCM schools. More than 1,200 students attended classes at the GCM’s schools last year which include courses of Greek as a second/primary language, courses of Ancient Greek for secondary school students and the Centre for Creative Drama and Arts. Also, there is strong interest in the Ancient and Modern Greek teaching programs for adults. • Holy Trinity Anglican Church Hall (Wednesday): Corner of Dandenong and Warrigal Roads, Oakleigh, parking available. Learn Modern Greek and Ancient Greek by attending our courses offered in 2017 and planned according to the Common European Framework of Reference for Languages.